The Hun School of Princeton’s varsity ice hockey team is off to a 7-4 start this season, picking up right where it left off last year, after capturing the 2013 Independence Hockey League Championship. Jonathan Bendorf ’17 leads the offense of Hun School varsity ice hockey with 23 goals and 11 assists. The Hun School of Princeton’s varsity ice hockey team is off to a 7-4 start this season, picking up right where it left off last year, after capturing the 2013 Independence Hockey League Championship. Though the team graduated nine players last year, the sustained success comes from what Coach Ian McNally describes as excellent leadership, team cohesiveness, and the enthusiasm of youth. “After graduating nine players last season, it was initially daunting to think that we would fill those spots with fourteen-year-old players. But, our freshmen players are highly skilled, and they found their place quickly on the team,” said Coach McNally. Freshmen Jonathan Bendorf ’17 (23 goals and 10 assists) and Evan Barrett ’17 (11 goals and 13 assists) are contributing significantly to the team’s successes. The two freshmen starters lead the team in points, and have accounted for more than 54% of goals scored this season. Earlier this year, Jonathan and Evan, along with teammate and classmate Blake Brown ’17, were selected to the Atlantic District team – a developmental program for elite youth hockey players. The three starters have played together on various club teams and development camps for the past several years. “With so many new players, it was important that we learn how to skate together, quickly. That our freshmen already had experience playing together really helped. But also, I give a lot of credit to our upperclassmen for welcoming our younger players to the program and making them feel part of the team. From the first day of school, in September, it was clear that [Captain] Devin Cheifetz ’14 and the returning guys were looking forward to playing with this young group. 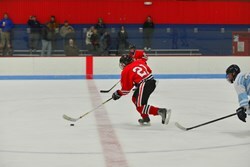 It made it that much easier for us to get on the same page when practice began in November,” said Coach McNally. The Raiders' 2014 hockey schedule is available here. On Saturday, January 11th, The Hun School will host an alumni hockey game, bringing players back to the ice for a friendly match and an opportunity to meet the new faces of Hun School hockey. The Hun School of Princeton is a co-educational, private day and boarding school in Princeton, New Jersey. Individual attention and strong student-faculty relationships are the hallmarks of the School. On the 45-acre campus between Philadelphia and New York City, student-centered, hands-on learning prepares students for the global community in which they will live and work. The Hun School is comprised of 629 students in its Middle School, Upper School, and Postgraduate Program. The Hun School is home to students from seventeen countries and fifteen states.